The latest installment in unnecessary internet distractions is more than just a meme. It’s an exercise in catharsis for anyone who has ever suffered a gross misspelling of their name by the ultimate corporate culprit: Starbucks. For all those Megans out there who have been accidentally referred to as everything from Metric System to Woolly Mammoth, but never their actual names, this website is for you. Created by Justin Hook and powered by images from a Tumblr entitled Starbucks Spelling, the website prompts users to enter their name before completely bastardizing it and offering up a different name entirely. 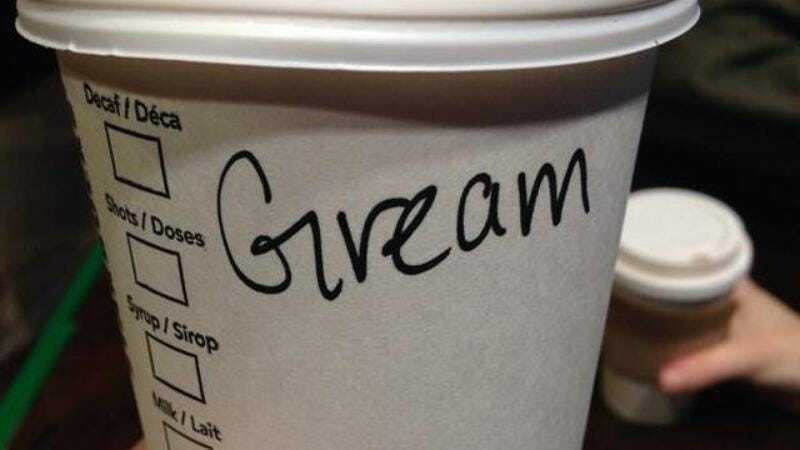 To keep the fun rolling, users can then push the “That’s Not What I Ordered” button to see additional user-generated images of Starbucks spelling errors. Internet shaming, meet Andrewes Kaye’s frappuccino. You two play nice now.